Apparently I am all about cozy recipes right now, and this Easy Coq au Riesling is just that. If there’s one thing my entire family loves, it’s a really good chicken dinner. I’ve mentioned this before, but growing up my brothers, and I okay my mom and I too, survived off of chicken and rice. It’s a Gerard family thing/staple/comfort food. My dad would make roasted chicken, or potato chip chicken (cookbook recipe, and probably my brothers all time favorite food), a few times a week. We would even eat chicken leftovers after school. 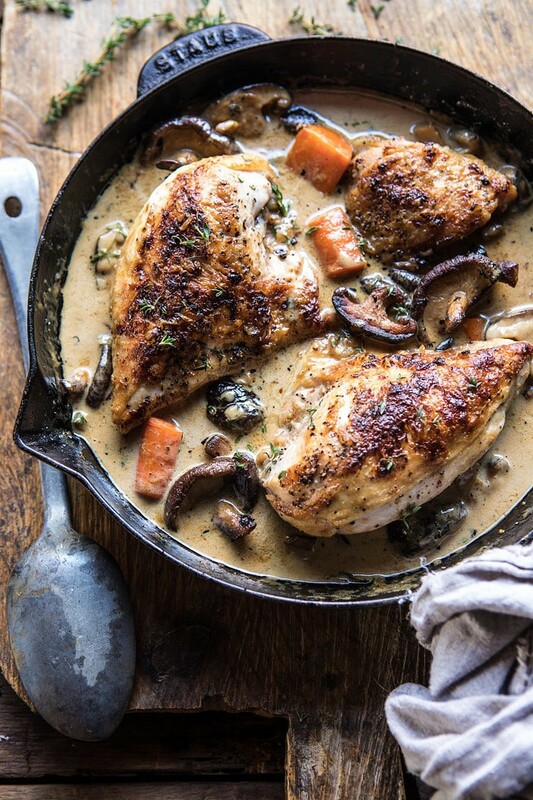 Easy Chicken Coq au Riesling from Half Baked Harvest on Vimeo. I definitely do not survive off chicken and rice anymore, but I still consider this combo to be one of my favorites. And I totally consider a good chicken dinner as my kind of comfort food. Plus, something about a roasted chicken is so simple, yet so elegant. I don’t know why exactly, but it’s always an impressive, crowd pleasing meal to serve. I think we have to give Ina Garten credit for making the roasted chicken so popular though, she is the queen of a great roasted chicken. The month of December is about two things for me cooking wise. Thing one, easy meals that I can either quickly prepare or prep in advance. December has a full long to-do list… holiday parties, family time, and just general chaos. I LOVE it, but it doesn’t leave much time for cooking up a storm in the kitchen. It’s always nice to have easy recipes on hand during this crazy holiday month. Thing two, really good, cozy, classic, comfort food. December is cold, the days are short, and the nights are long. Like most people, this leaves me craving warm comfort foods. I love embracing these cravings and cooking up some of the coziest meals to enjoy with family and friends. 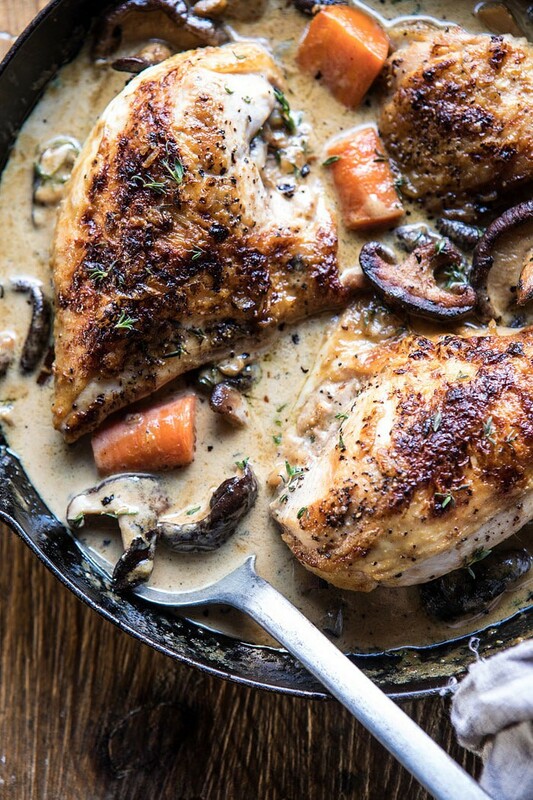 This chicken is both easy and cozy. And it’s all about the sauce. 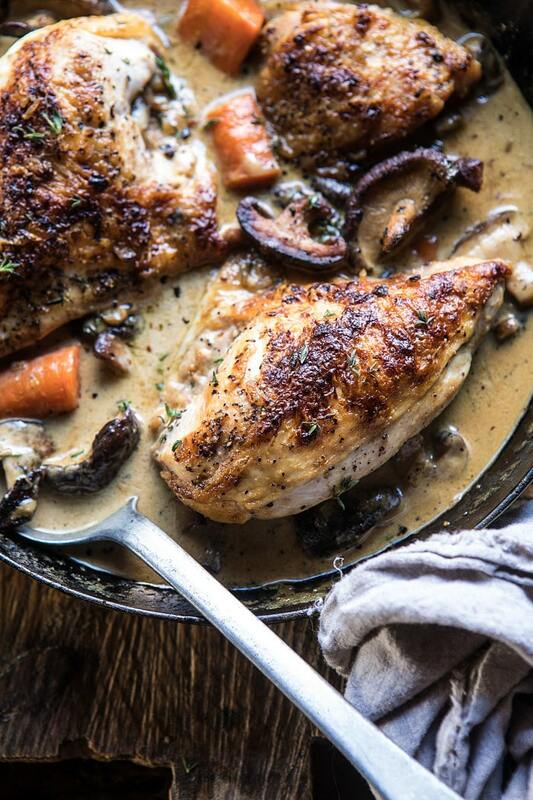 It’s creamy, simple but flavorful, and delicious when spooned over the roasted chicken. If you’re curious, Coq au Riesling just means chicken cooked in a wine based cream sauce. It’s basically the white wine version of Chicken Coq au Vin (chicken cooked in red wine), and you guys, it’s beyond delicious. 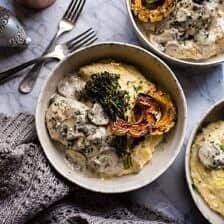 As mentioned, the creamy sauce is everything, but unlike traditional Coq au Riesling recipes, I added one secret ingredient to give it a little boost of flavor. I used Sir Kensington’s Dijon Mustard (always my go-to Dijon Mustard) to give the sauce the slightest tangy hit of flavor. You barely know it’s there, but the mustard’s flavor pairs so well with the dry white wine and cream in the sauce. It’s what makes this recipe over the top delicious. 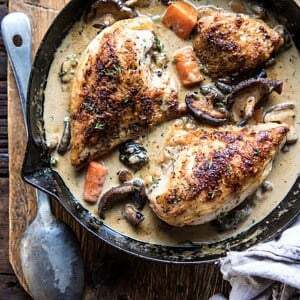 Traditionally, Coq au Riesling is made with chicken breasts, thighs, and legs, but to speed up the cooking time I love simply using bone in, skin on chicken breasts. Leaving the skin on and the bone in adds all the flavor, but using breasts makes this a quick cooking, under an hour, dinner. Plus, it’s also a little lighter this way too. 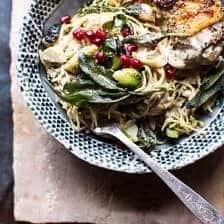 This dish is the perfect easy Monday night recipe, but also fancy enough to serve for a holiday dinner or party. Bonus? It’s all made in ONE skillet. Yes, yes, yes, loving my one skillet recipes so much these days! 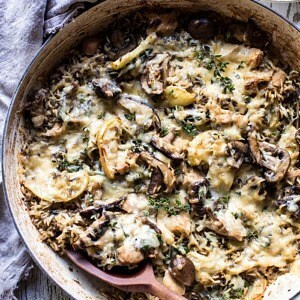 This dish is the perfect easy Monday night recipe, but also fancy enough to serve for a holiday dinner or party...and all made in one skillet! 1. Preheat the oven to 400 degrees F. Season the chicken with salt and pepper. 2. 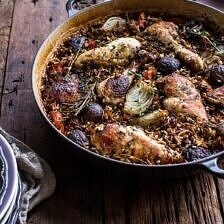 Heat the olive oil in a large dutch oven or cast iron skillet set over medium high heat. When the oil begins to shimmer, add the chicken and sear on both sides until golden, about 3-5 minutes per side. Remove the chicken from the skillet. To the skillet, add the butter, onions, garlic, carrots, and mushrooms. Cook, stirring occasionally until the onions have caramelized, about 5-10 minutes. 3. Add the wine, cream, mustard, and parmesan. Season with salt and pepper. Bring to a boil over high heat and then reduce to low. Slide the chicken back into the skillet, skin side up, it should be mostly submerged. Add the thyme and transfer to the oven and roast for 25-30 minutes or until the chicken is cooked through. Serve the chicken topped with fresh thyme. For real though, the sauce is just the BEST. Trust me. Chocolate Dipped Vanilla Bean Cashew Crescent Cookies. Yes definitely try it! I hope you love this Ruth! Thank you! 100% trying this recipe this week! This disk looks yummy. I love one-dish dinners. I do too! They’re just the best. I hope you love this Joyce! What about the mushrooms? Thanks. This recipe looks amazing! Unfortunately my husband is not a mushroom lover. Can I replace it with something else? If you watch the video, they go in with the carrots. That looks soo tasty – your food photography is always on point! Hello Tieghan. Happy to see French recipes and ingredients inspire you! I only have a little comment: Your recipe title is redundant. Coq means rooster (chicken) in French so no need to add an extra “chicken” before the word coq. 1) Is there any reason to use bone-in rather than boneless? 2) Does this get covered while it’s in the oven? Would cooking in a braiser work just as well as a skillet? Do you think you could swap the heavy cream with coconut milk? Or other nondairy? I think full fat canned coconut milk will be great! This looks amazing Tieghan! However your title for this recipe is redundant. Coq means chicken in French so you’ve named it: Chicken chicken. It looks wonderful and I can’t wait to make it! But I do have a question: When did you add the mushrooms? This seems like the perfect recipe for tonight. One question though, I got an InstaPot over Black Friday. How would I do this in the InstaPot without sacrificing flavor or the nice crispy-ness that your pic looks like? I made your InstaPot white bean stew over the weekend and it was great…hoping to do the same thing with this recipe! So glad you like this! Thank you Mariana! 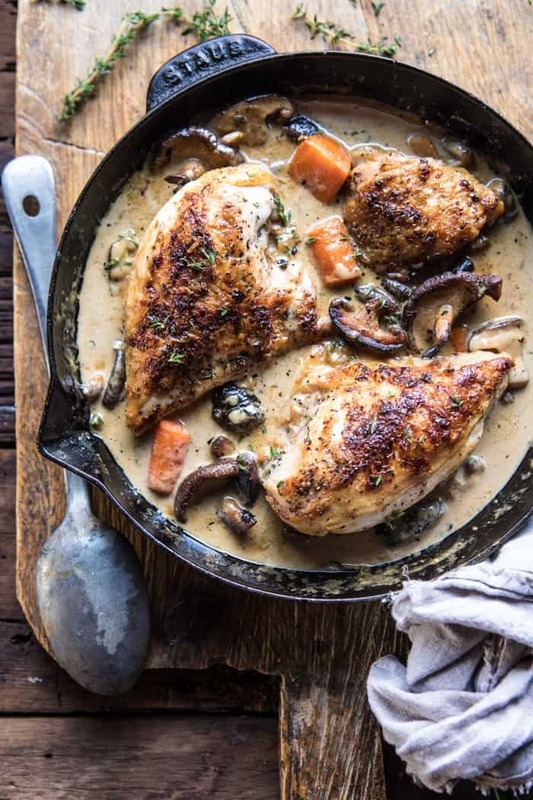 Mmm, I see my French peers have already made comments about your recipe title, I confirm the word coq means chicken (more exactly rooster – the bird we cook in our ‘coq au vin’ recipe), but that’s just a detail because this looks delicious! It’s surpringly very cold and snowy in south of France and excatly the kind of comfort food we need. I hope you love this Anaïs! Thank you! I wondered the same. Almost all rieslings are sweet. It’s the nature of the grape. This looks so good! Is there anything I can replace the heavy cream with? I love Sir Kensington’s! This dish looks Yummmmmm! Omg! The look on this chicken. Loving the creamy mustard sauce. Thanks for delicious idea. So glad you like this! Thank you Savita! I agree that Ina is a go-to person for quality recipes. Haha I love listening to her on her show (she’s so peaceful). Also, I was thinking of getting my mom a new food processor for Christmas (she’s had her kitchen aid one for 20+ years 😳), but I’m not sure which one to get. Do you have any standard food processor recommendations? HI! I think green beans and rice sound like the perfect sides for this chicken. YUM! As far as food processors go, I am still on the hunt for a great. I currently have a Cuisinart and it works really well! My only complaint is it’s size, it’s a little big, but I do have the 14 cup. Tieghan, I came across this at about 4 pm tonight and it was on our dinner plates at 6:30. My wife and I loved it. My wife said that it reminded her of the sauce that they put on the duck at our favorite restaurant in Paris. It is so full of flavor. The only change I made was I dredged the skinless boneless breast in seasoned flour before browning. I also put some poultry seasoning in the sauce as I built it. We will absolutely make this again. Thank you for all of your fantastic recipes. That is so amazing! I am so happy you and your wife enjoyed this recipe Mark! Thank you! Thank you Naomi! I hope your family loves this! Looks delicious! I made your Moroccan chicken tagine using thighs and legs (for the kids) on Sunday, and I think the leftovers we ate last night were even better than the first night we ate it! Looking forward to trying this recipe later in the week… Thanks so much for these easy one-skillet dinners!!! I am so glad you liked the Moroccan chicken and hope you love this recipe! Let me know 😊 Thanks Stephanie! I am so craving a cozy dinner and this looks perfect!! Hi! I recently found your blog and am already obsessed. I cant wait to try your recopies, especially this one. I am extremely new to cooking so I am also building out my cookware. I was hoping you may have a recommendation on what size cast iron skillet to purchase for this/similar recipes? I made the Coq au Riesling last night for dinner; it was a last minute decision and I happened to have all the ingredients in house. I always make new recipes as written and try to never alter them until I’ve made it as intended first. It really and truly turned out wonderfully, came together quickly, and my husband (a picky and particular foodie) declared this recipe a keeper and I wholeheartedly agree and there will not be any modifications to future preparation! 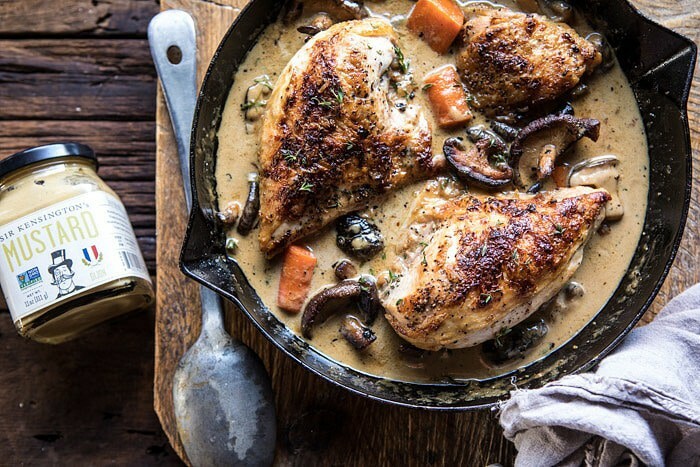 We’ve made traditional Coq au Vin and tried numerous recipes over the years to mostly both agree that they’re just okay, so this is stupendous to add this to our collection or tried and beloved recipes. BTW – I love the HBH cookbook and recently gave my niece a copy and she’s loving it too! Thank you! Hi! I am so happy that you loved this recipe and the book! Let me know what you make from it! 😊 Thank you Sookee! Thank you Tieghan for the most delicious recipes! I’ve been in such a cooking rut lately and your recipes have been pulled me right out. This dish is currently in the oven and our house smells amazing! My fiancé can’t stop saying how good dinner smells. We made your Pappardelle with Roasted Butternut Squash and Tomato Ragu and it was such a hit. These have been the perfect dinners for cold winter nights. Awh that is amazing! I hope you love this recipe Whitney, let me know! Thank you! Awh that is amazing! Thank you Jackie! Making this for dinner right now! The kitchen smells amazing!! That is so great! I hope you love this recipe Ellis, let me know! Thank you! This was ABSOLUTELY AMAZING! We loved it!! How long would you suggest cooking if using a combo of bone-in breasts, thighs and legs? What type of white wine do you recommend? Would love to make this! hi! this looks rad! any suggestions on what white wine i can use instead of riesling? kinda hard to find here. thanks! what wine would you pair with this dish? Thanks! Wonderful recipe and totally doable on a weeknight! I spoiled myself and just made it tonight – so delicious and comforting. Thank you, Tieghan! 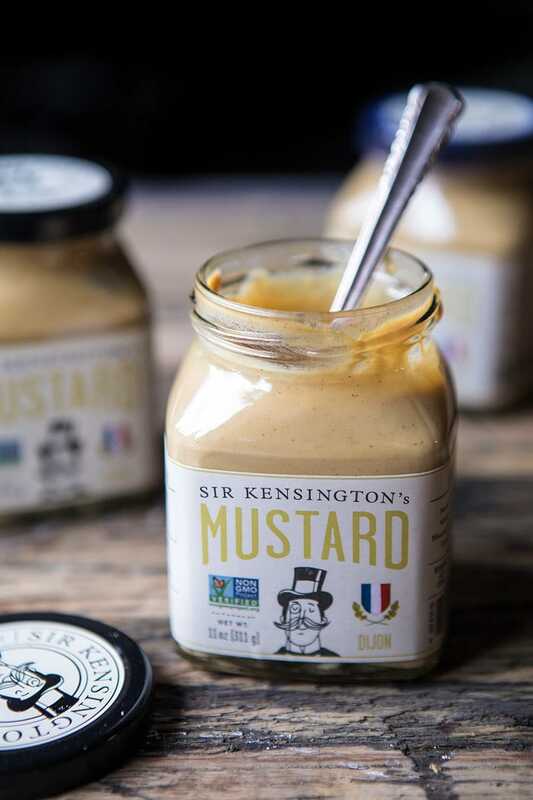 Sir kensington mustard is my all time favorite! I thought it was just a Pacific Northwest thang….expensive but so worth it. just read the ingrediant list on most mustards…..youll see why its so good! Hi! I spend way too much time on your site, you rock. I’ve made this for company twice now and it will be my go to for a while. It’s amazingly delicious and simple! I’ve been doubling the recipe to feed between 8-12 people. In doing so, I’ve found that, while the chicken goes fast, I have a lot of sauce left over. So, this last time I made some pasta and topped it with the leftover sauce – so, so good! Your book and website are amazing. Thanks for all that you do! I am SO glad you love this recipe Jacque! And the added pasta sounds so good! Love that! Thank you! I really loved this recipe. It was auumazzing. Such a sophisticated twist on a French classic, bringing together the traditional fare of the Old World, and California’s world class wines. This dish was a hit on my last event, thank you for your inspiration and creativity. Best regards, and cook on!! I have made this 10 times probably! My fav recipe from your site and I have made 50+ of them! Making it again tonight and felt impelled to leave a comment! Thats so amazing! I am so glad you love this recipe and others on my blog! This came out absolutely amazing, and was so easy as well! I had some small red potatoes on hand so I halved them and threw them into the mix as well. Really lovely dinner – huge taste and minimal fuss! Is there any room for bacon in this recipe? Also, what do you typically serve this with? Thanks! Looks divine! First time and added broccoli… Was amazing! Thank you for recipe idea and broccoli suggestion. I am so glad this turned out amazing for you Nicia! Thank you! Can this be made with boneless chicken breasts? Had this for dinner tonight and it was great! Thank you for all the recipes you share with us! I am so glad you loved this Alison! Thank you! I made this for my husband just after Christmas. He said it was the best thing I’ve ever made. 🙂 Knocked another one right out of the park Tieghan. Thank you for making me look like a classically trained chef! I am so glad this turned out so amazing for you! Thank you Martie!